The Maidnem band exists since 1996. The band’s name is based on a pun, since ’majdnem’ means ’almost’ in Hungarian. The band started its career as a hobby band. Its members were members of other well-known Hungarian bands. They just came together in this band to play their favourite Iron Maiden songs. Later on, with more and more people coming to see the band’s shows, the band’s attitude became more serious and professional. Now the band is playing at all the important festivals in Hungary in the main show time in front of thousands of people. In the beginning fans became enthusiastic about the band only beacuse of the quality the guys played Maiden songs, but today the audience is overwhelmed by the show paraphernalia, as well. Eyes are overwhelmed by the gigantic backdrop which shows a flaming Eddie head and the picutres which cover the amplifiers. 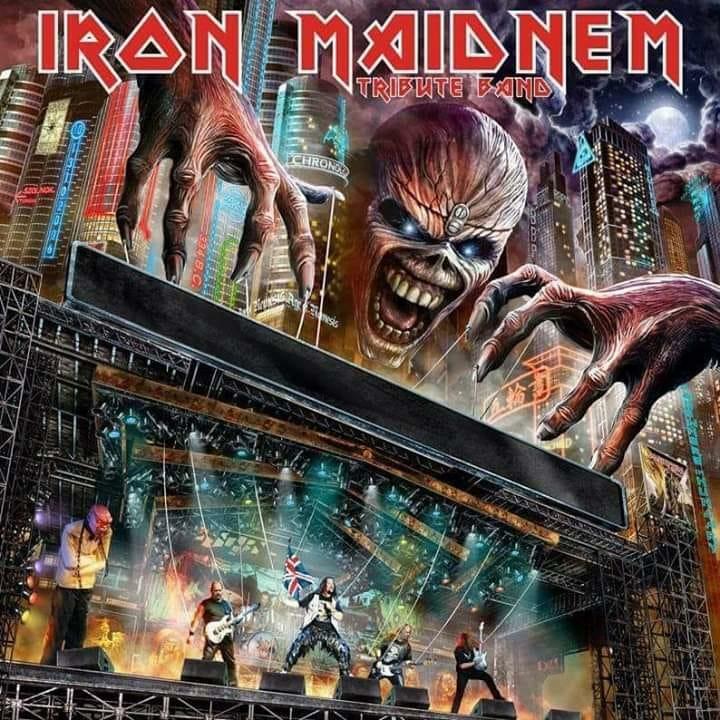 On top of all these, there’s a 2.5-meter tall moving Eddie figure which makes the audince feel as if they were watching a real Iron Maiden show. Today, Iron Maidnem plays lots of shows outside Hungary. They play in Germany, Slovakia, Roumania and Serbia. Iron Maidnem plays around 60 Maiden songs among them such titles which Iron Maiden never played live like ”Alexander the Great”, ”Back in the Village”, ”Invaders”, ”Gangland”, ”Only the Good Die Young”, but of course you can enjoy all the Maiden classsics, as well, among them such brilliant songs like ”Moonchild”, ”Aces High” and ”Flight of Icarus” which are long gone from the repertoire of their original performers. Inca nu a fost adaugat continut media la evenimentul: Tribute Iron Maiden: Iron Maidnem LIVE @ Capcana.